Have you ever joined a guided visit for children in a museum? Or at least eavesdropped on one? It's in those situations that I realize why kids have the time of their life, whilst the adult visitor is yawning his way through yet another painting. Clever information is presented to the little ones in a playful way and complicated concepts are explained for everybody to understand. In this sense guided tours are similar to guidebooks. The hard facts are served appetizingly to the kids, whilst adults churn their way through lists of historic data prone to be forgotten immediately. As if academic and entertaining couldn't go together! No surprise then that my favorite Siena guide has been written with, exactly - kids in mind. Explore and Discover Siena. 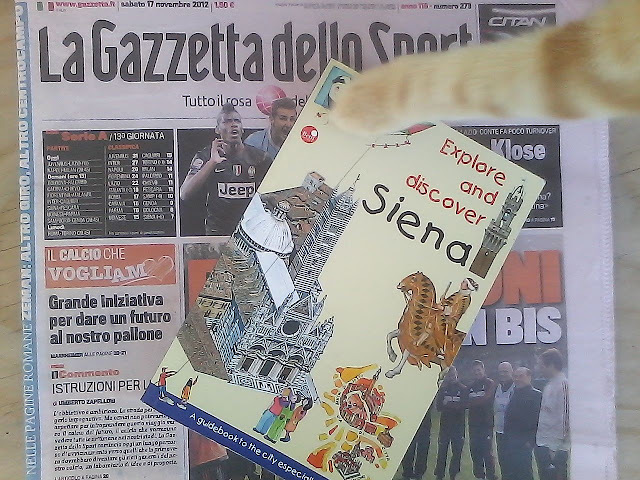 A Guidebook to the City Especially for Children is exactly what the title says: a guide to Siena for children, but luckily for adults too! It will take its readers to the city's main sights (Cathedral, Piazza del Campo, Palazzo Pubblico, etc), but it will also show you the Siena most tourists miss out on. The guide manages to be concise and in-depth at the same time. Siena's important moments in history are a leisurely read, as much as all the interesting background information. Sections like 'How to Make a Panel Painting' or 'How to Make a Stained-Glass Window' will be interesting and fun for the whole family. In fact the kids may have a hard time getting the book out of their parents' hands. Or did you know about the importance of choosing the right garment for a pilgrimage to Rome, or how to tell apart one medieval monk from another? Last but not least there are eight pages about the Palio, with plenty of photos and queer facts about the world's most spectacular horse race. The book is lovingly designed and illustrated, and small enough to fit in your handbag. The whole family will enjoy browsing through it. Not just in Siena, also on the sofa once back home. Considering that this is my favorite guidebook to the city of the Palio, buy it anyway - even if you travel without kids. EXPLORE AND DISCOVER SIENA. A GUIDEBOOK TO THE CITY ESPECIALLY FOR CHILDREN. Right now the English version of the book is still unavailable on Amazon or Kindle, but waiting for you at the main bookstores in Siena and at the well stocked Opera del Duomo and Santa Maria della Scala museum shops. Price: a well invested 12€.